Dinner with my daughter yesterday and the meal I planned was a bust. 2 entries tasted like cardboard and overdone tomatoes. Plan B was my fav backup of a Madhur Jaffrey recipe out of World Vegetarian , a side of crunchy veges, and Carrot Soup. My daughter is ‘brutally’ honest about the dishes I prepare and she liked all 3. Madhur’s Baked Large White Bean dish is heavenly and it’s a good thing as she collected the recipe from nuns at a monastery in Macedonia. I made with canned Northern beans for a double recipe. 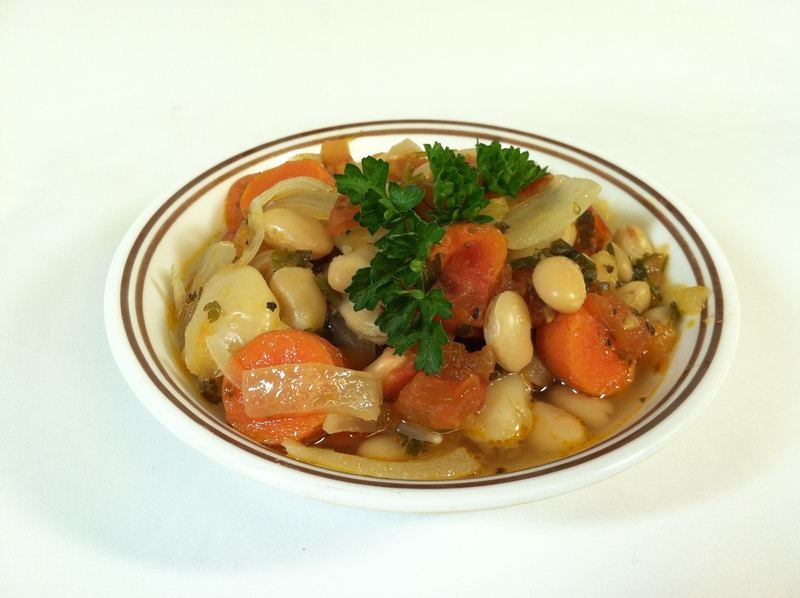 1 cup dry beans (or 3 cups of canned beans–2 -14 oz cans = close to 3 cups//my parentheses), 1/4 cup olive oil, 1 medium onion cut into thin half moons, 1 medium carrot, 2 6-7oz. tomatoes, finally chopped, 1 1/4 tsp salt, black pepper to taste, 2-3 TBSP finely chopped fresh parsley, 1 TBSP dried oregano. If you are using canned beans, rinse them and then proceed to the next step. Madhur says, “If the liquid from cooking the beans is required in the recipe, you will have to use water or a light stock as the liquid from canned beans should be discarded.” For my purposes, I used 6 cups of canned and drained Northern Beans for a double recipe. And I added 3 cups of water as that is about the amount of water she recommends if you fix the recipe with dried beans. I have previously measured this to be sure. Meanwhile, heat the oil (for a double recipe I still only use 1/4 cup and it could probably be cut out all together if you like), stir and cook the onion for 1-2 minutes until onion has just wilted. Add the carrot and cook another minute, stirring as you go. Add tomatoes and cook 7-10 minutes, or until the tomatoes have softened. 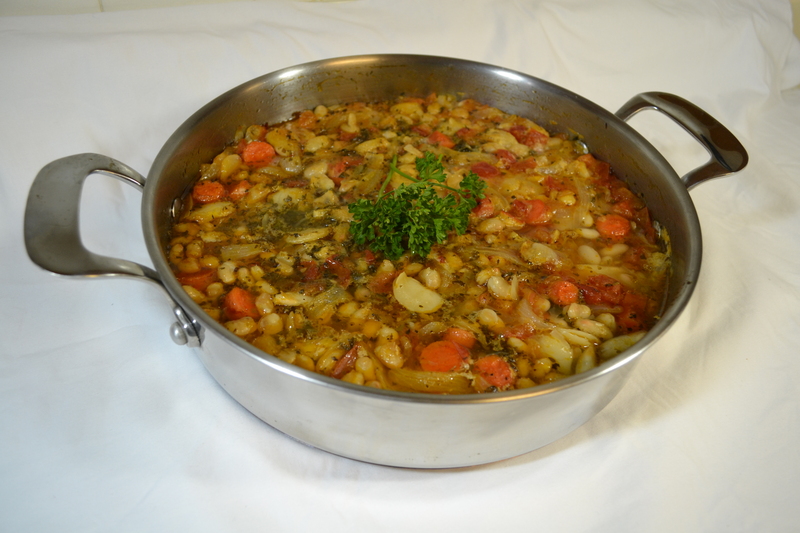 Add the beans and liquid (water or stock as above) to the dish with the onion, carrot and tomatoes. Next mix in the salt, black pepper to taste, the parsley and oregano. Put all in a casserole dish, into the oven and bake, uncovered, for 2 hours, serving hot. Looks delicious and delivers! Madhur Jaffrey’s cookbook is my favorite for general reading up on global vegetarian dishes. Her detail and suggestions are out of this world! Well, not really, as it’s all about cooking in and around our world!